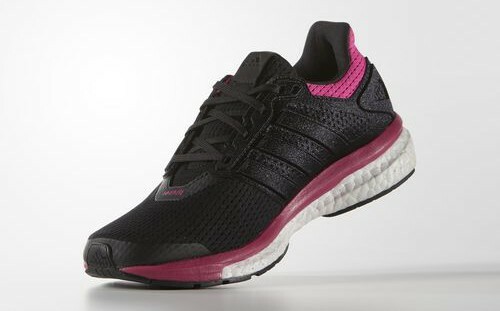 According to the adidas website: "These women's running shoes are the ultimate experience in luxurious stability. Whether you're training or running a full marathon, their plush boost™ midsole keeps every step charged with energy. An adaptive adidas Primeknit upper and ergonomic heel give lightweight support exactly where it's needed, and a STRETCHWEB outsole provides a smooth, stable heel-to-toe transition." According to the Running Warehouse wesbite: "Glide effortlessly through your daily miles with the adidas Glide 8. A Boost midsole delivers remarkable energy return and responsive cushioning,while a torsion system aids in a smooth foot transition. Along with a durable continental rubber outsole and a comfortable engineered mesh upper, the Glide 8 is ready to hit the roads." Boost, unlike traditional foam used in running shoes, is made with tiny plastic pellets. They make the shoes feel very, very soft. If you like running in high cushion shoes, these are a great option! The fit: Most runners agreed that the sizing was a little big. Both shoes have very flexible uppers that allow a lot of give. Some runners ran in a half-size smaller than usual and some were able to stick to their true running shoe size. Will they make you faster? Depends on who you ask. We have runners of all paces so finish times at run club usually varies. However, on this particular night, we noticed that all of the runners kept a slightly faster pace! Could be the shoes... or the cold weather. Style: Super cute! Wouldn't mind wearing either pair to run errands. Have you tried any adidas Boost shoes? If so, let us know in the comments. Thanks adidas and Philadelphia Runner for hosting us! You may also like: THE BEST SHOES FOR RUNNING | WINTER 2016 EDITIONLike this article? Get more posts, resources and training tips delivered to your inbox every Monday morning. Sign up here.